Kaka has been called up to the Brazil squad for next month's Copa America in the United States. 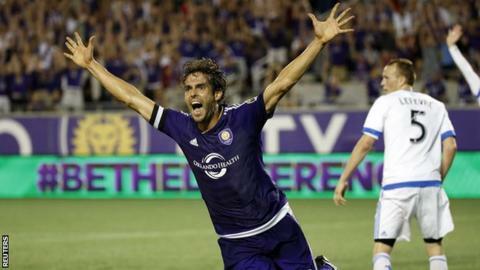 The Orlando City midfielder, 34, will replace Bayern Munich's Douglas Costa, who was removed from the squad because of an injury to his left thigh. Ex-AC Milan and Real Madrid player Kaka has been a regular in coach Dunga's squads, without getting much game time. He has won 91 caps and scored 29 goals, but has only played 60 minutes for his country in three years. Kaka is the second player to be added to the squad because of injury, with Benfica's Jonas replacing Santos striker Ricardo Oliveira. Brazil have been drawn in Group B with Ecuador, Haiti and Peru for the tournament, which is staging a special 100th anniversary edition.